This contest started on 12/14/17. This contest has a winner. * Win A $25 MOD Pizza Gift Card. Jeff Eats got a $25 MOD Pizza Gift Card to give to one of you guys! The $25 Gift Card is good at any MOD Pizza locstion (for locations, menu, info- modpizza.com). ***** MOD Pizza, 7171 North State Road 7, Parkland, Florida 33067, (754) 812-1192. Got a real good reasonably priced- build your own pizza & salad joint for you guys, MOD Pizza which opened in Parkland something like 6-weeks ago. Unless you’ve-just arrived from Planet-Mars, you know the concept- order at the counter/ food delivered to table, gas fired oven/ pick your dough, sauce, cheese, toppings. MOD (Made On Demand) Pizza is a national pizza chain with something like 215 units scattered throughout the United States. The Parkland joint is the chain’s first Florida location (indoor- table, booth, counter seating and outdoor table seating). Yesterday, Jeff Eats and Mrs. Jeff Eats did lunch at MOD- and I gotta tell you- that the pizzas we “built” were absolutely delicious! 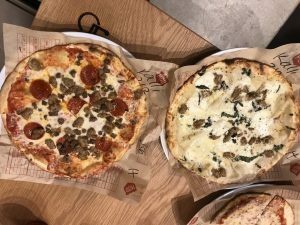 Like I said 2 seconds ago, you’ve seen the “concept” before- with that in mind, MOD Pizza was right on the money decor-wise, food-wise, service-wise and price-wise! You guys can read all about the 60’s Rock N Roll music that MOD plays, its “healthy” menu offerings, complete menu/prices. locations and assorted other information at modpizza.com. MOD Pizza is open Monday-Saturday 10:30am-10pm, Sunday 10am-10pm. A gift card would help to try MOD pizza. I would love to try this place. Doubling my chances to win. The pizza here is great. Guys give it shot!